The Christmas party season is well and truly upon us now and I thought what better to write about than a makeup look that I'll be sporting for the parties this season. 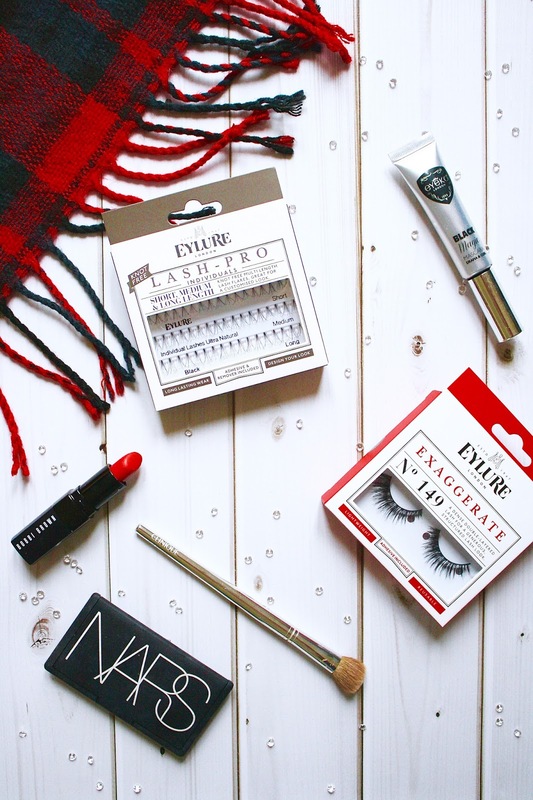 Personally, when I think of Christmassy makeup, bold eyes and lips come to mind. When I was recently contacted by the lovely team at FalseEyelashes.co.uk and given the opportunity to feature some of their false lashes, I instantly knew that they would be used for my Christmas party makeup. 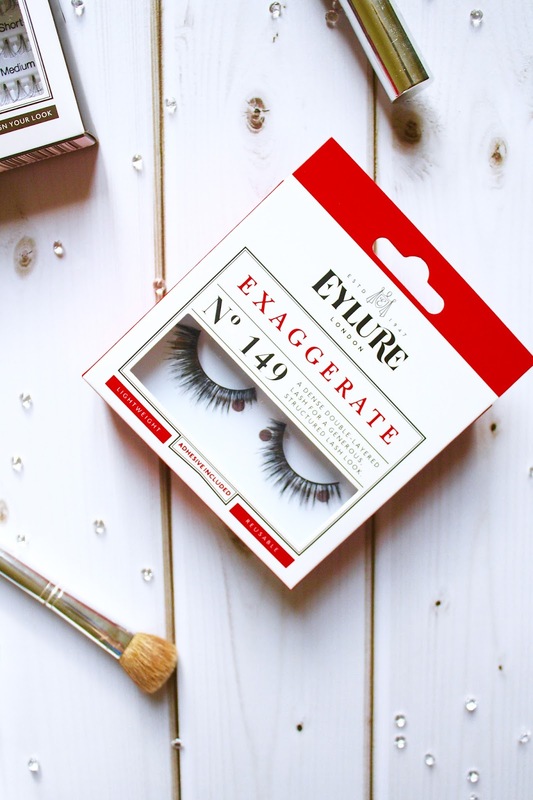 They have lots of different collections on their website including lashes by Sam Faiers, Ardell, House of Lashes and Red Cherry, just to name a few. The lashes I decided to try out were both from Eylure's range and I chose a full strip set (Exaggerate No. 149)* and a set of individuals too*. 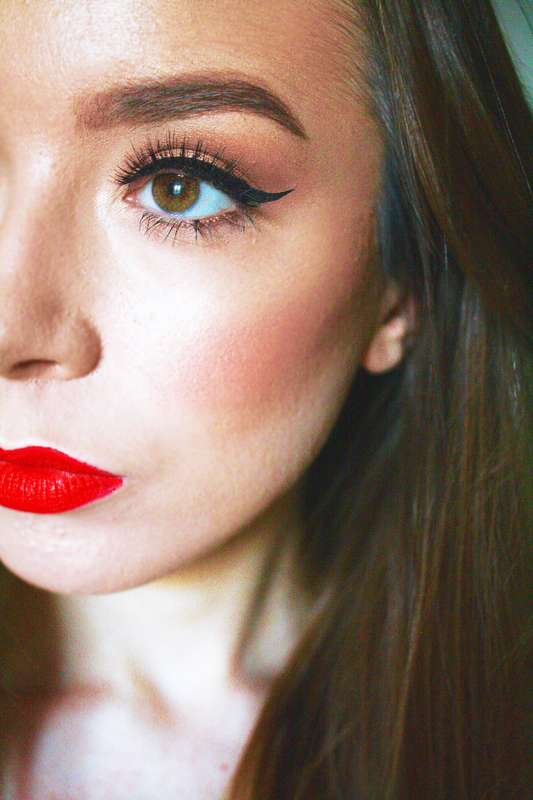 For the look I've put together in this post, I tried out the Exaggerate No. 149's; they were the more bold option from my two picks, as the name would suggest, and I thought they would be perfect for the bold eyes/bold lips makeup look I had pictured. 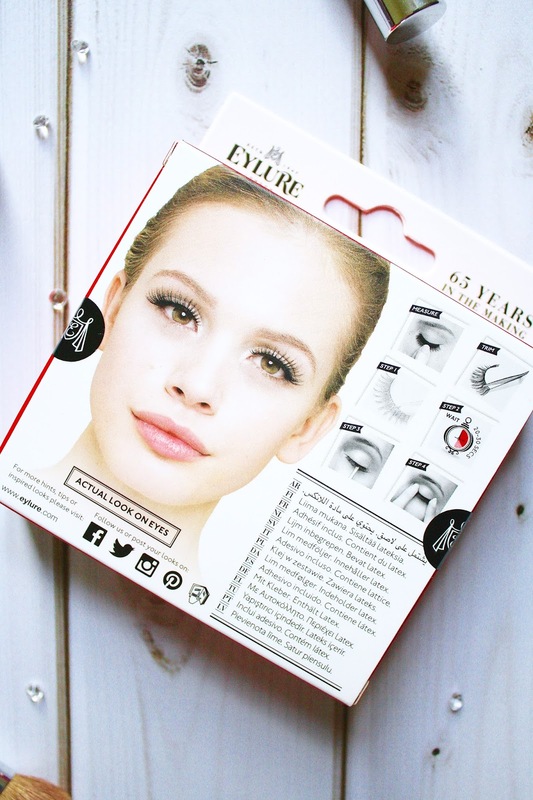 They were incredibly easy to apply, and I always find that Eylure's lash glue gives the best hold on application from past experience. 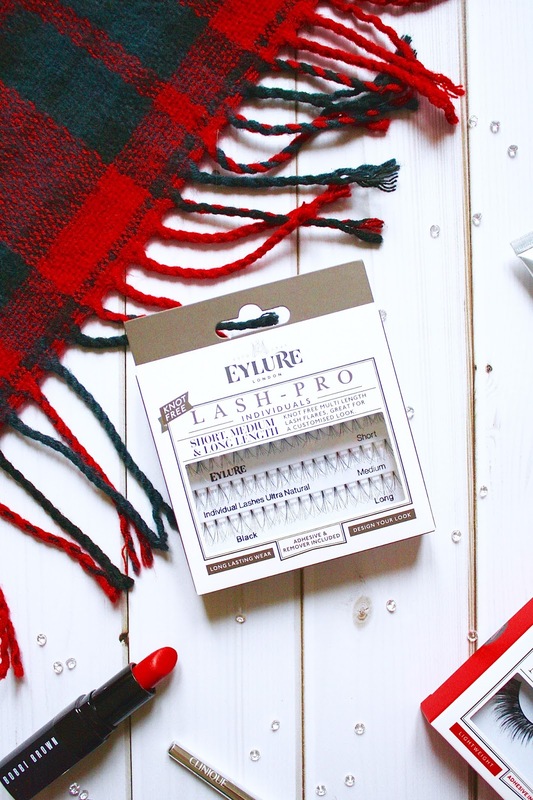 I'm also the kind of girl that gets straight in there and prefers not to use tweezers and I found these to be easy to press on once the glue had started to dry a little and the length was just right without any trimming of the lashes being necessary. For my eye makeup, I went for my statement copper/bronze-toned eyeshadow combination and used a mix of the Nars 'Isolde' duo (paler shade for my lid and darker shade for crease) with 'Fez' from the Nars 'Ride up to the Moon' palette to subtly line my lower lids. I have also been loving Eyeko's 'Black Magic' mascara lately as it packs on the intensity with just a few brush strokes and adds volume to my lashes, so I applied this before and after adding my false lashes to amp up the volume for this look. For my base, I kept to my trusty Esteé Lauder Doublewear in 'Shell, 1C0' to give a full coverage finish with my equally trusty Collection Lasting Perfection Concealer in 'Fair' and Rimmel 'Stay Matte' powder in 'Transparent' to keep it all in place. 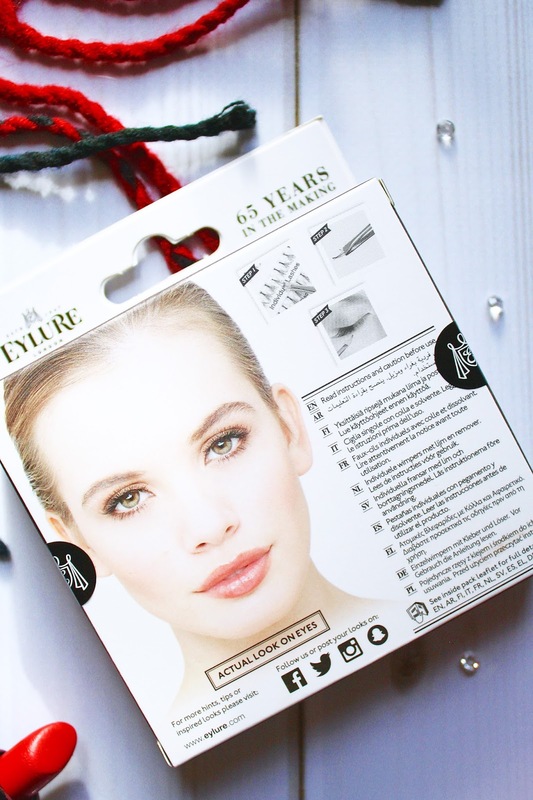 I think that these products would be the perfect combo to ensure your makeup doesn't start to budge during a Christmas party and it also means you won't need to check on this throughout the night either. Once the base was finished, I contoured and bronzed up my face to add a lot of warmth with my MAC bronzing powder in 'Refined Golden'. I do find that EL's Doublewear can make my skin look incredibly pale if photos are being taken at parties with a flash on, so in my opinion, being over generous with the bronzer is a must for me. I also filled in my brows with my Benefit 'Brow Zings' palette which has been a staple product in my makeup bag ever since my school days. The finishing touches to my Christmas party makeup look, aside from the lashes, came from my Becca Shimmering Skin Perfector (liquid) in 'Moonstone' along my brow bone and at the tops of my cheeks for a fresh glow, and my statement red lip. For my red lip choices, I went for Bobbi Brown's Rich Lip Color in 'Old Hollywood 2' as a base (a pinky/blue toned shade) and I topped this up with my NYX Soft Matte Lip Cream in 'Morocco' to add more of a 'post box' red tone to my lips. The idea behind this was for the Bobbi Brown lipstick to add lasting power as a base, with less of a need to touch up my makeup once applied, and the NYX lip cream to get the right shade for the look as I find a more vibrant red/orange tone to be more complimentary for my complexion. I can't wait to replicate this look once my office Christmas party rolls around later in the month, when I will be switching up my lashes and opting for the individuals to give them a whirl too.